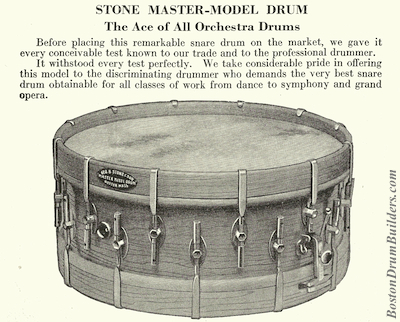 First introduced in 1922, the Master-Model Drum was George B. 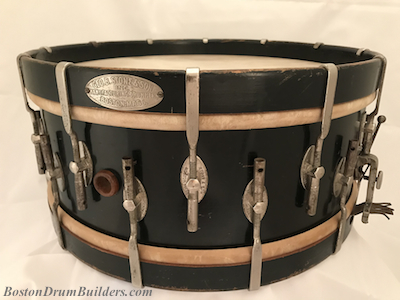 Stone & Son's premier snare drum offering and remains the most recognizable and iconic instrument produced by the company. 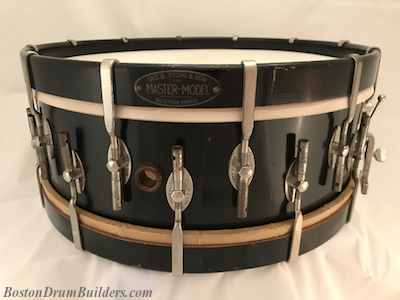 Originally marketed as the "All-Weather Drum", the name "Master-Model" was adopted by late 1922. 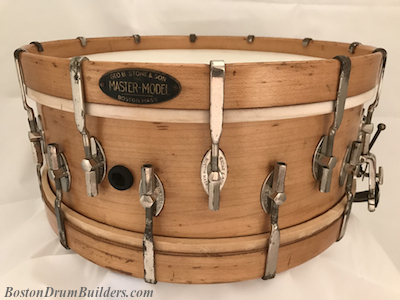 The Stone Master-Model snare drums were built from 5" x 14" staggered three-ply all maple shells, not single-ply maple as is sometimes reported. Slight variations in shell depth exist but the Master-Model was cataloged in only one size. 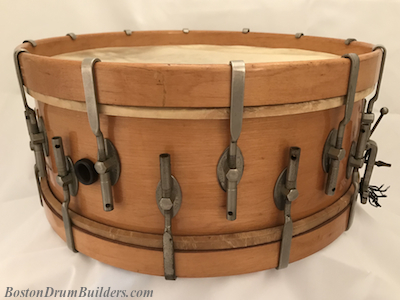 Hoops were constructed from a single ply of maple and were matched specifically to each drum. 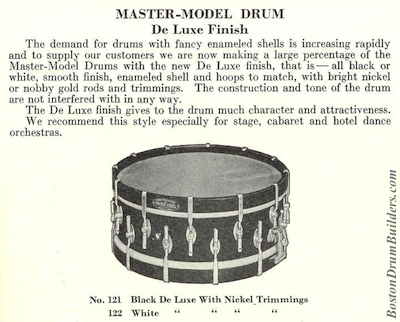 Master-Model snare drums were offered in a variety of finishes but the most common by far was what Stone described as "Black De Luxe Finish" with "Nickel Trimmings". Hardware was also available in "Nobby Gold finish", a faux gold plating, at an additional charge. 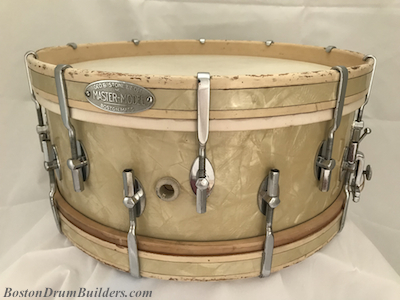 Natural maple is the second most commonly seen finish on Master-Model snare drums with "White De Luxe Finish" being less common. Examples in wrapped finishes including white marine pearl, black diamond pearl, silver sparkle, gold sparkle, and red sparkle were also produced but are less common. 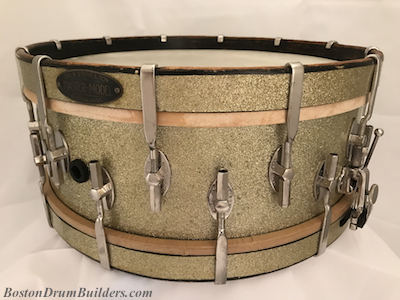 An all-metal Master-Model built around a solid aluminum shell with polished aluminum hoops was first introduced in 1925 but was produced only in small quantities. 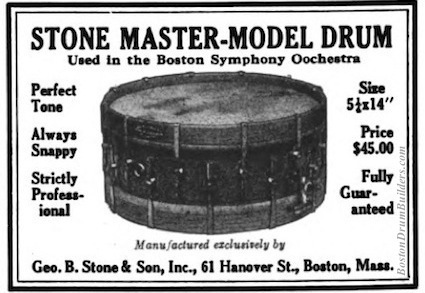 The Stone Master-Models were sold in dwindling numbers into the mid to late 1930s with more than 800 drums ultimately being built. In the next post we'll have Part I of the Stone Master-Model Dating Guide. Do you have a Stone Master-Model? I would love to hear about it! Feel free to send Lee an email anytime at lee@vinson.net. 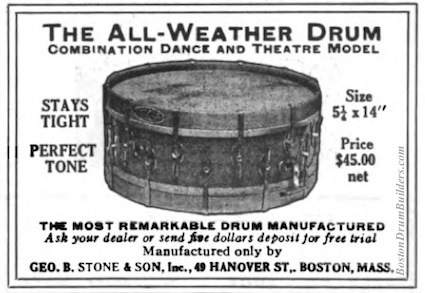 And for more on the other turn of the century Boston-based drum makers, please visit BostonDrumBuilders.com.